I jumped in at H and am currently at O. It’s been a fun journey but I’m in such great company! I drool over the calligraphers who can create such beauties in literally a stroke of their pen. I wish I could do that. I can render lettering but I draw them. Like most art, it takes practice to improve one’s craft and inspiration hit me last night to start this new journal. Just one sentence. Any other blurbs or write up will have to be elsewhere like here. Strictly in pen. 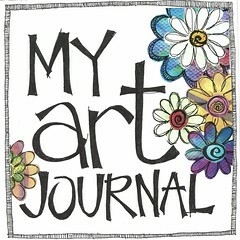 I have my art journal for the fancier stuff. In a small enough size that I can lug it anywhere. I want to be able to carry it with me easily without lugging a tome. The page size is also key if I am to do a page without devoting a day to it. My art journal is always a work in progress because I do the page layouts and then decided on embellishments and then do the actual journaling. This one is much, much more abbreviated than that. Should be a notebook I can tear pages off and later pull together into one journal. I must’ve rendered one line over 20x last night, tearing off the mistakes out. I will have to grab another one soon. I have these freebies I grabbed from a conference at work from a sponsor which was made of recycled paper. Perfect. No expense, and more importantly, the paper takes the ink from the pen with ease. This is as much to practice my lettering as it is to memorialize words and thoughts that might mean something to me at any given point in time. Self explanatory. I have been journaling since I was young, and I still have my handwritten journals which I began when I arrived in New York almost 18 years ago. 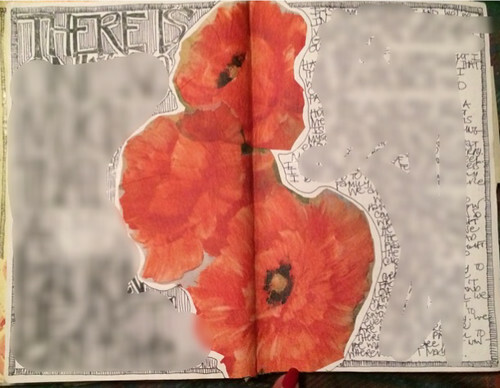 I’m almost done with my first art journal in an altered book, and I’m beginning a new one. This is both simple and not simple, but it works the same way in giving me a channel of self expression. Please note that this post has links which will open in another window to help you find the products mentioned. PinayNewYorker might earn a commission if you decide to purchase any of these products. I am constantly going through my things, sifting through what I can give away, throw away, or keep. There are always bits and pieces that somehow surprise me with a memory or a longer peek into “what used to be”. Being very sentimental by nature, I used to find it hard to just discard or throw away things, even long after they have served their purpose in my life, or if their meaning has changed through time or by virtue of circumstance. Letting go has never been easy for me, but several life altering shifts that took place in the last couple of years have caused me to just do that more easily. I am still not quite as adept at it as someone I know who will not think twice about throwing something that seems useless or nondescript. I’ve seen pieces of projects and parts of other things go missing, only to find out later it was mistakenly thrown away. But there are things that we need to get rid of or shed as we go through life. Just as we shed people, we must shed things. There just tends to be too much at some point in time and we must unburden ourselves of that load. I am doing just that. So I was actually looking for something else when I spied this notebook that I had used as a journal sometime in 2013, tucked somewhere in my room where I had meant to keep it hidden. I didn’t forget about it, but I just didn’t feel the urge to write in it. It was one of the “What do I really, really, really want?” journals. Like millions of others who read “Eat, Pray, Love” by Elizabeth Gilbert, I had followed her speeches and writings and picked up this prompt to help me focus on getting some clarity at a time when I felt I was “floating” needlessly. 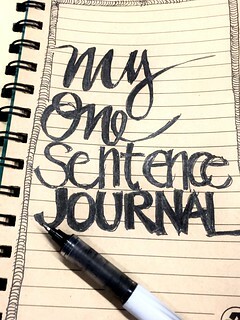 I have at least two of these journals, the first one, definitely ended. I was just hoping to read through the main response, not the journal entries themselves, and maybe make a visual summary of the answers I wrote down — but that idea got shot down once I realized where I was heading at the time I wrote that in 2012. Not worth it. Between then and now, I not only did a complete 360, but I had jumped from one universe to another. Still, I thought, it would be helpful to be reminded of my state of mind and heart back then, if only to go back to the lessons I learned from that experience. Once I’m done “being reminded”, that one will be shredded and gotten rid of in full. This second book that I have, I had written on intermittently during one of the most volatile periods in my adult life. In many ways, it got me to where I am now. It made me who I am now. So this one, I believe, is worth doing a visual summary for, and maybe even worth keeping. I haven’t quite started reading yet as I just stumbled upon the book this morning, but you can see it has sparked a different kind of inspiration within. I have leafed through the first 5 or 6 entries to start the visual summary. I haven’t even read the actual entries and I could hear my inner voice screaming what I wanted, and I am relieved I had actually gotten myself to get it done. It’s a very personal reveal that I’d rather keep to myself, but suffice it to say, even without reading back, writing those thoughts and sentiments made them a reality for me. I think I got, and am on my way to getting, that which I really, really, really want. I am now on my third journal and am into my fourth or fifth entry in a new notebook. A good amount of time and many life events and decisions have passed between the journals, and even I have found the change in my answers and state of mind quite enlightening. I know that a lot has changed between 2012 and now– both in my personal circumstances and the world in general around me, and it has been quite a journey. It is in looking back at the answers I had written — not necessarily the journal entries per se — that I have seen such a marked difference in the way I used to think and the way I am now. The very stark difference between what I wanted then and what I want now gives me pause to reflect on how my feelings have changed since I first started answering the question. I had made it a point to just go over the answers and make a visual summary from time to time, but at this point, I don’t think I’m ready to read my entries in depth just yet. I am, however, ready to continue answering the question in the “now”. Gilbert says you have to repeat the “really” three times to stress that it has to be something you truly want — as against something you might “maybe want” or “half want.” It must also be something spontaneous after asking the question. This time around, I’ve taken to doing a bit of art around each entry. 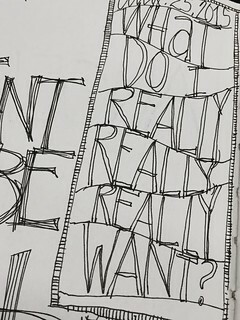 Whether it is to draw a border around the page or color in the lettering of either the question or the answer, or to add some graphic I intend to fill in with color later on, each additional time soent embellishing the page gives me a chance to reflect deeper into my answer. Sometimes the succeeding blurb is a sentence or two only. Sometimes it fills the whole page. Again, the key is spontaneity. Answering the question when I write on that journal’s pages is like an ongoing essay that gets written a bit at a time with each entry. And when I go back to read them all, I’m supposed to find my answer from the very words I’d written. This really started just as another spread painted in one color, and while I sometimes edit the background before starting to write, this layout needed major first aid with the pages falling apart from each other. Masking tape to the rescue. Of course, I wouldn’t leave it just like that, but I wanted to keep journaling instead of editing the page before writing. The cut out of Angelo’s picture on the right came later, as well, as it’s a new picture of him taken during the first day of school. 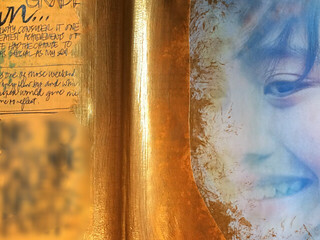 Gold was my color of choice which I brushed on top of the masking tape and sort of “splattered” with the brush on the edges of the photo. (Angelo was complaining about my doing that, but I told him it was to create a certain effect in the layout.) I like how acrylic paint easily covers and adheres to masking tape although I think the drying time is a little longer than doing it just on plain paper. I like acrylic over masking tape as a writing surface, though, as the pen glides through it nicely and it absorbs the ink just the same way. So here’s the final page, with the entry written in another text direction. I like doing that to separate the days when a spread accommodates several days. I hate leaving blank spaces in my journal. My journals are not quite as artistic or fantastic as most other art journals that make even me drool for its color and impact. 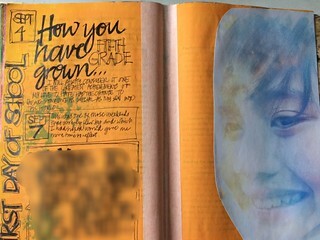 I am working with an altered book which in itself is still a work in progress, and I am enjoying creating layouts to later embellish or write on. 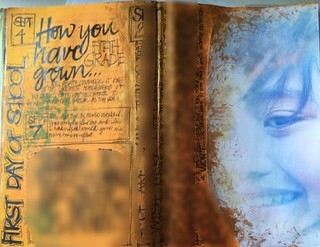 It is also different writing on a page you had created yourself instead of being confined to plain journal pages. 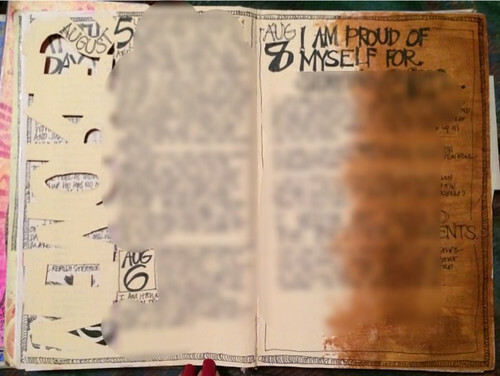 Luckily, I am many weeks ahead of the actual journaling as far as the altered book is concerned, so I can choose to stick with plain journal entries (simply writing them) or embellish already existing backgrounds. Some art journalers prefer to start from scratch and create the page, but it’s the writing more than the art that really draws me to the project, so I tend to be very text heavy instead of just “representative” of what I am feeling or thinking about in the art journal. As they say, to each his own. This is my journal, after all. I haven’t done an update on my Art Journal Every Day project for a while now and I thought I’d do that before I got too far behind. I simply cut out the flowers from two sides of the napkin and laid them out in the middle to cover the masking tape. 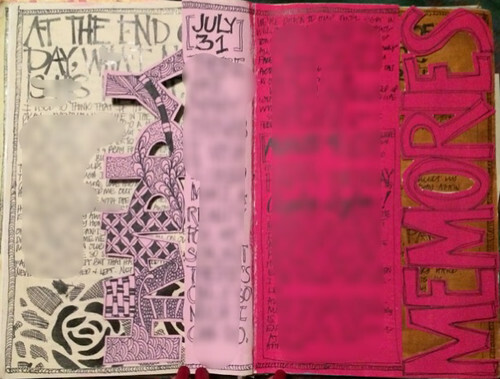 I drew some word art on one side and confined the journaling to the other. 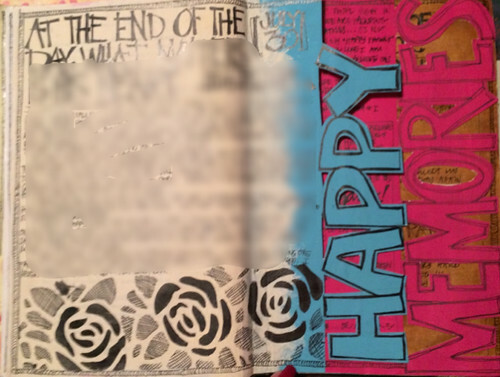 The next one is part of a multi-page layout I had done a while back, with cutouts of “HAPPY MEMORIES” done over a three layout spread. Here is the second page layout. I completed the spread and even managed to zentangle on the back of the first word cutout. 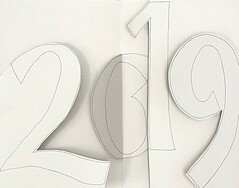 The third layout spread still has the back of the cut out word blank. I’ve even gone further with the next layout. I had the word art done a long time ago, but didn’t know where to put it unntil I came across another all-white background. 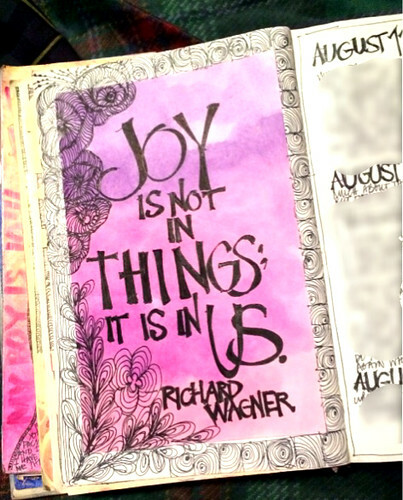 As you can see, I simply zentangled around the word art and proceeded to art journal on to the next layout — and more about that for next time. I’m trying to be consistent with the journaling and hope to finish up this book by the end of the year. I am tempted to start another one but I don’t have the energy or the time. Sometimes even just choosing the “format” or size of the journal can be such an effort.